COMING SOON: PATTERN IS IN THE WORKS AND WILL BE PUBLISHED IN EARLY DECEMBER. Sign up to the mailing list to be notified when it’s released. Due to popular demand, we’re working on a free pattern for a very special scarf. It’s inspired by the one Jodie Whittaker is wearing in the latest Doctor Who press photos. 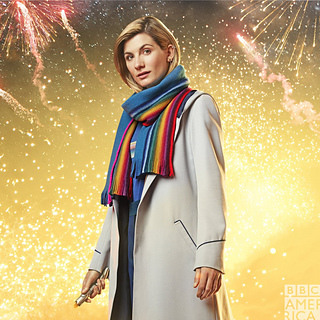 It won’t be identical, because the original is machine-knit at very fine gauge, using a technique which is extremely difficult to achieve in handknitting but it will carry the spirit of Jodie’s scarf. This is a very simple pattern (just sideways garter stripes really) but it will include step-by-step photos for an easy way to achieve the fringe at each end of the scarf. The image shows the swatch - this is narrower than the actual finished scarf will be, but demonstrates the principle. The pattern will be published for free on the Knit Now Magazine blog - sign up to the newsletter to be notified when it’s available.